MEDFORD, Ore. — Chabad Jewish Center of Southern Oregon will open its doors on Monday, October 22nd, at the Medford library at 4:30 p.m. The organization says this will be the first ever Hebrew school that will open in Medford. “Our Regional Jewish Center is located in Ashland but we saw a great need to branch out to the Medford area to service all those families that need to drive a distance just to participate in any Jewish activities,” stated Rabbi Avi Zwiebel of the Chabad Jewish Center. One goal of the school is to mix Jewish Heritage, Hebrew reading, and Holidays with STEAM (science, technology, engineering, art and math). 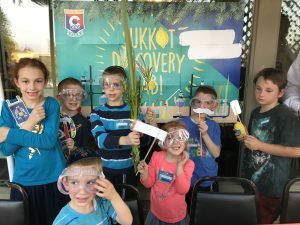 “The underlying approach is that the children thoroughly enjoy their time spent at Hebrew school so that they are left with positive experiences and a greater appreciation for Jewish life,” stated Zwiebel. Hebrew school will be held for children ages 2-13. Dinner will be served during the session. To register or for more information, email [email protected] or call 541-482-2778.